It's No Joke: Venezuela Cracks Down On Comedians : Parallels Venezuela's economic woes provide plenty of fodder for comedians. But the government doesn't seem to have a sense of humor: Comics say they are being targeted and prevented from performing. 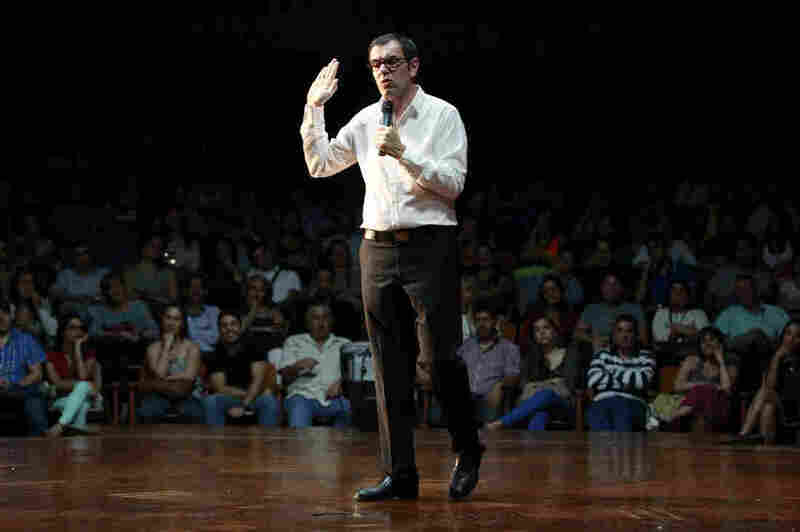 Venezuelan comedian Laureano Marquez performs a stand-up routine at a theater in Caracas last year. Marquez says the government is now cracking down on comedians who make jokes about the government and the country's economic problems. Laureano Marquez was performing a benefit at his old high school in the Venezuelan city of Maracay. The comedian dwelled on the absurdities of life in this oil-rich nation, where gas is cheaper than water but it's hard to find milk, toilet paper and many other everyday goods. In the supermarket, Marquez said, desperate customers will steal scarce items right out of your shopping cart. "In Venezuela, you get robbed of stuff that isn't even yours yet," he said to a round of laughs. That message doesn't sit well with Venezuela's president, Nicolas Maduro. Besides jailing opposition leaders and cracking down on protesters, the Maduro government is now going after comics. Marquez says that three of his recent shows were canceled after all three clubs that booked him were suddenly closed down for alleged tax evasion. He's also been shut out of government-run theaters and hotels. Another headache is securing city permits to perform. Requests from controversial comics are often rejected by mayors loyal to Maduro, according to comedian Alex Goncalves. Chataing TV was a popular fake news show on Venezuelan television, but was shut down last year after joking about the government. "They say: 'No! If you have jokes about the revolution, you can't present,' " said Goncalves. "They think that because we did jokes about Chavez or Maduro we are going to bring down the government." Even when Goncalves is allowed to perform, there can be trouble. After one show, he was chased out of town by government supporters. "We have to run to the car and go, like criminals, because these people have no sense of humor," he says. "And that's very sad." Also gone is Chataing TV, a popular fake news show. Last year the show's host, Luis Chataing, made fun of the government's frequent claims of coup plotting by the opposition. In a skit, Chataing portrayed a government bureaucrat fabricating evidence of a conspiracy with paper, scissors and glue as if part of a kindergarten art class. The crowd loved it. The show was canceled the next day. Chataing said the government pressured the station's owner to take him off the air, a claim President Maduro brushed aside. "What do I have to do with your program?" Maduro said in a speech. "Enough with these evil rumors. I'm busy doing my own job." For their part, comedians are scrambling to stay employed. Nowadays, they often perform at corporate events or at private theaters in Caracas and other cities run by opposition mayors. Amid the creeping restrictions on free expression, Laureano Marquez said, comedy is vital. "Humor is the last place of liberty. When you lost freedom in other places, freedom can be alive in humor," he said.